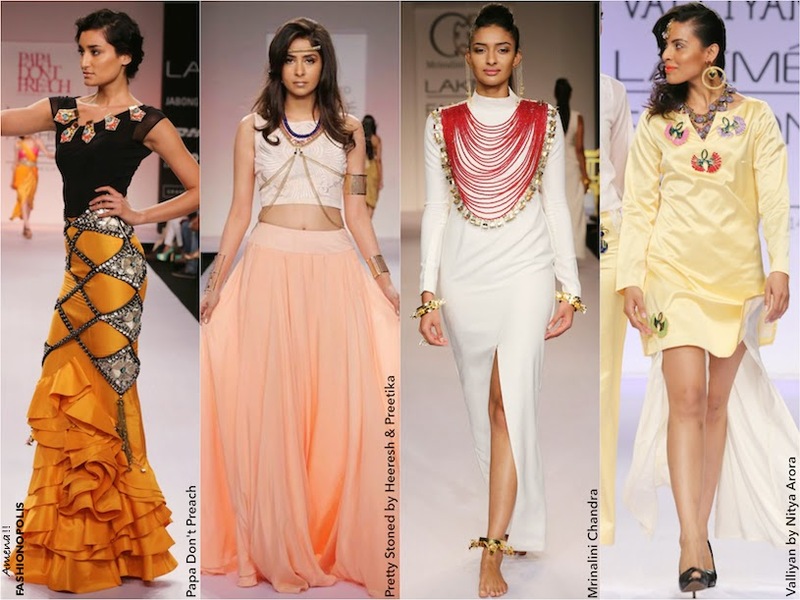 Like I mentioned in Part I of my Lakmé Fashion Week Summer/Resort 2014 Top 10 Trends post, instead of a generic rundown of the collections I decided to highlight the top 10 trends seen at Lakmé Fashion Week Summer/Resort 2014. 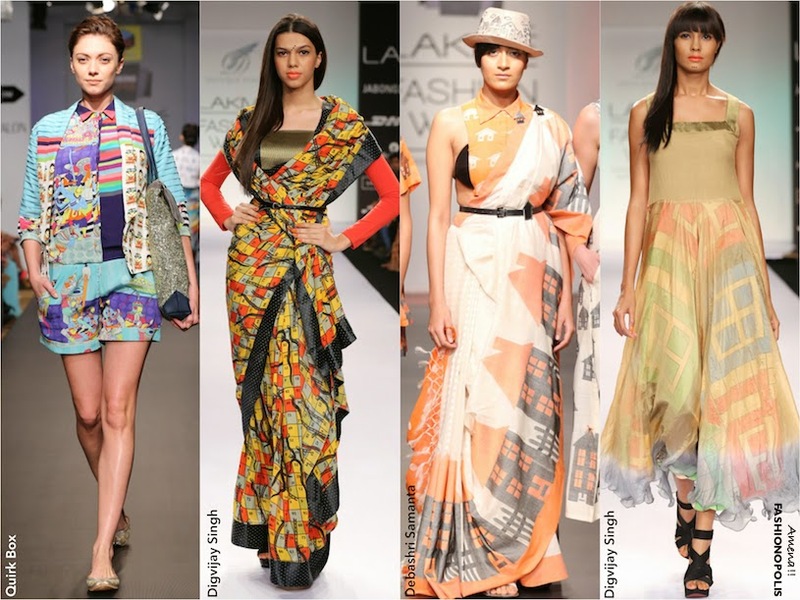 Here' is the second part of, Lakmé Fashion Week Summer/Resort 2014 Top 10 Trends. From the looks of it, fashion is still high on all things 90’s. However, this season punk and grunge have given way to the crisp, clean minimalism of the late ‘90s. 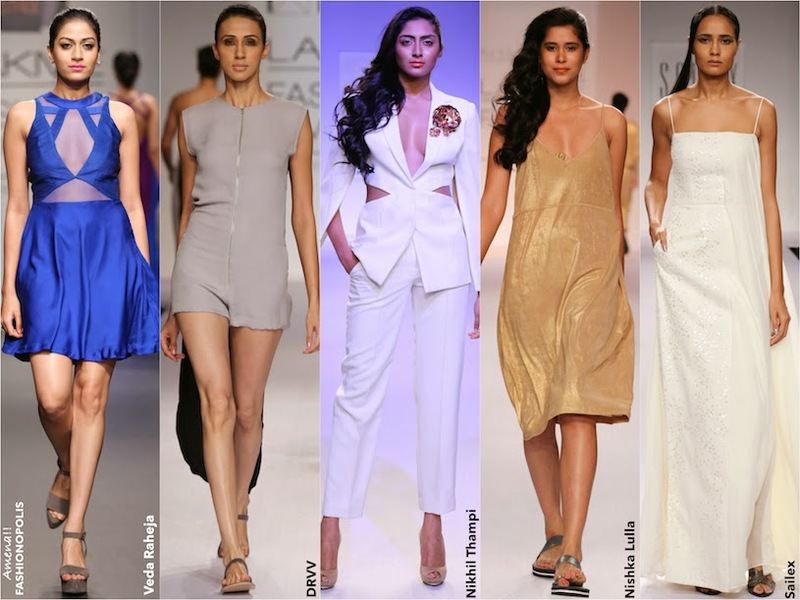 Delicate spaghetti-strapped slip dresses made an appearance at Sailex and Nishka Lulla, while Dhruv and Nikhil Thampi opted to go with the season’s new minimalism in simple and structured suits and separates. The humble drapes have come a long way this season. 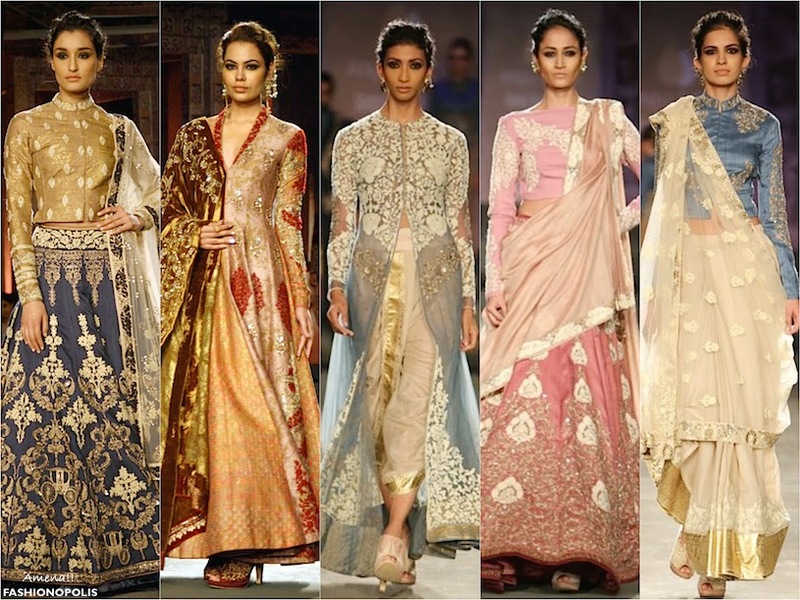 While fashion week regularly gets its share of sarees and dhotis, this time round, designers have chosen to present the classic drapes in new avatars. 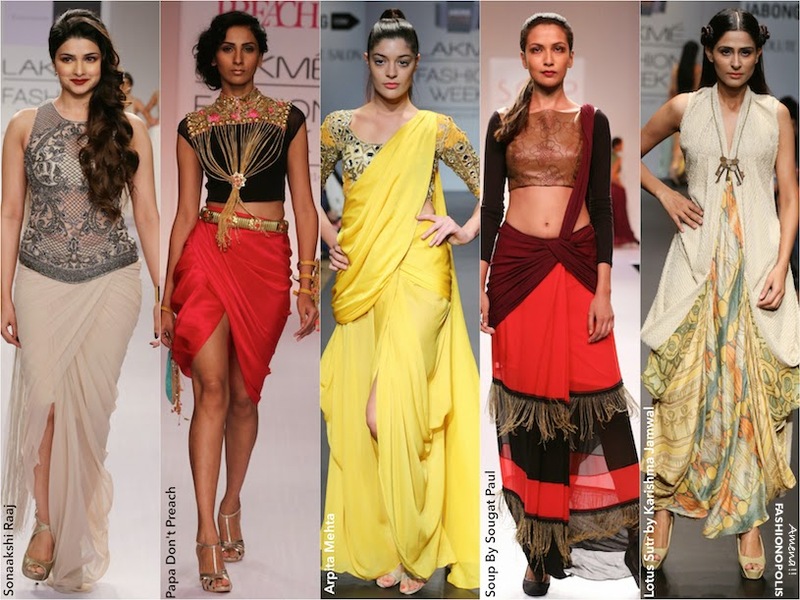 From exotic saree gowns by Sonaakshi Raaj to Arpita Mehta’s dhoti pants to Karishma Jamwal’s funky cowl skirts, the traditional drapes have been modified and wrapped around in a variety of novel styles and silhouettes. There is nothing that makes my heart beat faster than a pretty statement jewellery piece. This season of LFW was a bauble lovers dream come true. While Preetika and Heeresh Zagjivan of Pretty Stoned tried to seduce us with their ‘Egyptian Princess’ inspired pieces, Nitya Arora’s jewellery collection for her Valliyan label took us on a whimsical journey, as her designs moved from reality to fantasy. And as much as Mrinalini Chandra insisted for us to ‘Please Have a Seat’, her cleverly crafted accessories had us jumping out of our seats in awe of these beauties. Ever since quirky became mainstream, offbeat, non run-of-the-mill motifs have been making regular appearance. From cars to houses to anime to pretty much anything that catches a designer's fancy, the new motif is all about being different and making a statement. Seeking inspiration and finding it in the colours and motifs of Snakes and Ladders and Ludo, Digvijay Singh showed a whole new chic side of our beloved childhood board games. While Rixi Bhatia and Jayesh Sachdev of Quirkbox, choose to stay true to their quirky roots and continued to woe fashion denizens with their eccentric ‘Quirk-E-Sultanat’ collection. This season of LFW was crushing on all thing metallic- gold, silver, bronze, copper, gun metal- ever shade of metal known to man was welcomed with open arms. 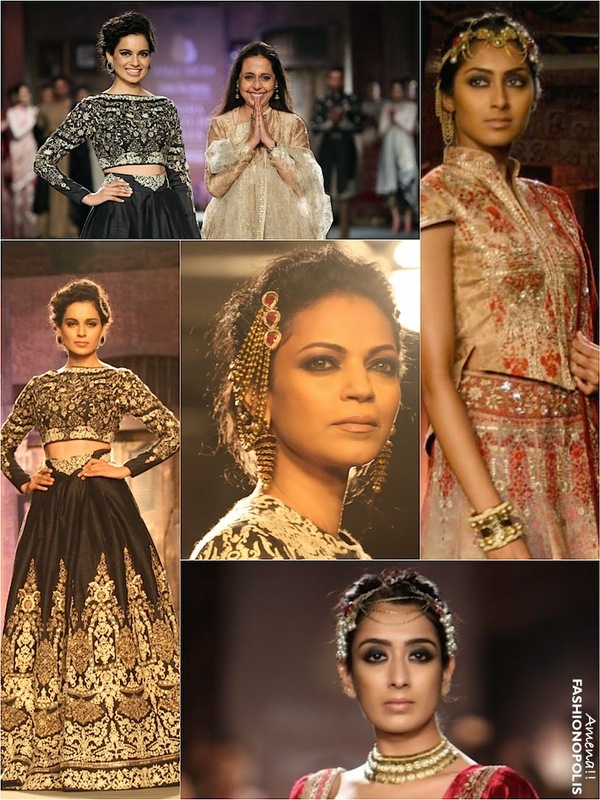 From Kommal Sood’s ‘Champagne Bubbles’ to Jyotsna Tiwari to Rajesh Pratap Singh’s ‘Illusion’, metallic made its glittery presence felt. 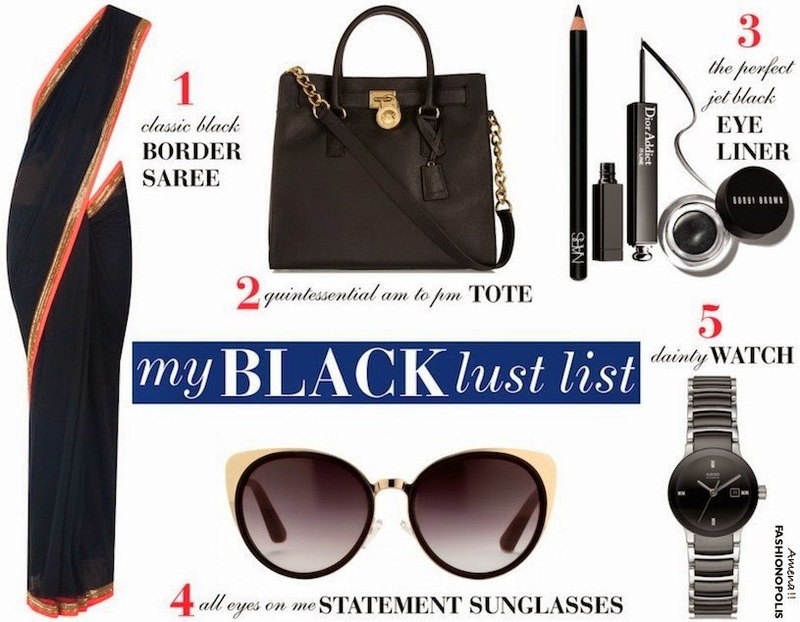 Which of these Lakmé Fashion Week Summer/Resort 2014 trends has your name written on it?